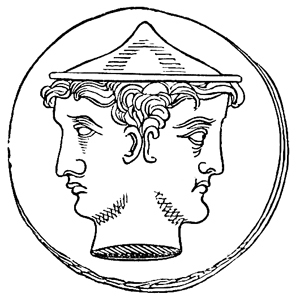 January derives its name from the ancient Roman God Janus, god of doors and gateways. 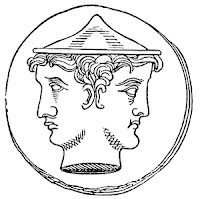 Janus is the male equivalent of one of the versions of the Goddess Juno-Janus, who in her two-faced aspects of Antevorta and Postvorta looks simultaneously forward and backward as does Janus. Modern tradition would have us look forward only and forget the past year like a bad memory. I would advise those who follow this tradition to remember… That which is forgotten is soon repeated. January is the first month of the Gregorian Calendar, and the second of Winter’s rule. The original Roman calendar consisted of 10 months (304 days). The Romans originally considered winter a monthless period. 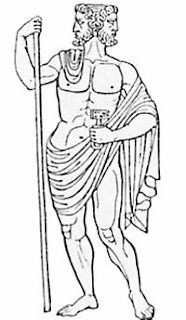 Circa 700 BCE Romulus’ successor, King Numa Pompilius, added the months of January and February allowing the calendar to equal a standard lunar year (364 days). A Roman superstition against even numbers resulted in the addition of one day thus equaling 365 days. Although March was originally the first month, January usurped that position because that was when consuls were usually chosen. Historical names for January include its original Roman designation, Ianuarius, the Saxon term Wulf-monath (meaning wolf month) and Charlemagne’s designation Wintarmanoth (winter / cold month). In old Japanese calendar, the month is called Mutsuki (睦月). The second day of the month is known as Hatsuyume (初夢) and the 7th day as Nanakusa (七草). In Finnish, the month is called tammikuu, meaning “month of the oak”. The first Monday in January is known as Handsel Monday in Scotland and northern England. This day is so named for the gifts or handsels that are given to children. In England, the agricultural year began with Plough Sunday on the Sunday after Twelfth Night. To the Irish, January is Eanáir or am Faoilleach, the ‘wolf month.’ The full moons of February and December are also sometimes referred to as Wolf Moon. The first Full Moon between Yule and the 25th of January is most often called Disting, and it shares the name Cold Moon with December. It may also be referred to as the Quiet or Chaste Moon, or the Moon of Little Winter. Capricorn and Aquarius are the signs for January, Aquarius gaining power on or around January 20th. The flower for January is the white carnation. Garnet is the favored stone of this month, though Jacinth appears on some lists. Garnet, along with the ruby, is also the birthstone for Capricorn, while Aquarius lays claim to aquamarine. Other stones associated with Capricorn are amber, amethyst, carnelian, fire agate, green tourmaline, labradorite, peridot, and sapphire. 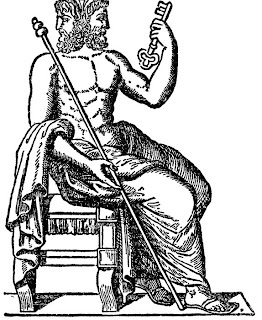 Aquarius also holds sway over chrysoprase, garnet, labradorite, lapis lazuli, and opal.